Last month we were asked to pick a bread of our choice and bake it for our group “We Knead to Bake”. I chose to bake a relatively simple recipe that was tried out by the group last year. It was Khaliat Nahal or honeycomb buns. I made them and photographed them right at the beginning of February but i had to put off updating my blog as i was traveling for a good part of that month. Anyway getting back to the bread, Khaliat al Nahal or Khaliat Nahal is a middle eastern bread which is usually made in the month of Ramadan. The word Khaliat Nahal translates as bee hive. The bread has been aptly named so for they are baked so close to each other that they resemble a honeycomb pattern. 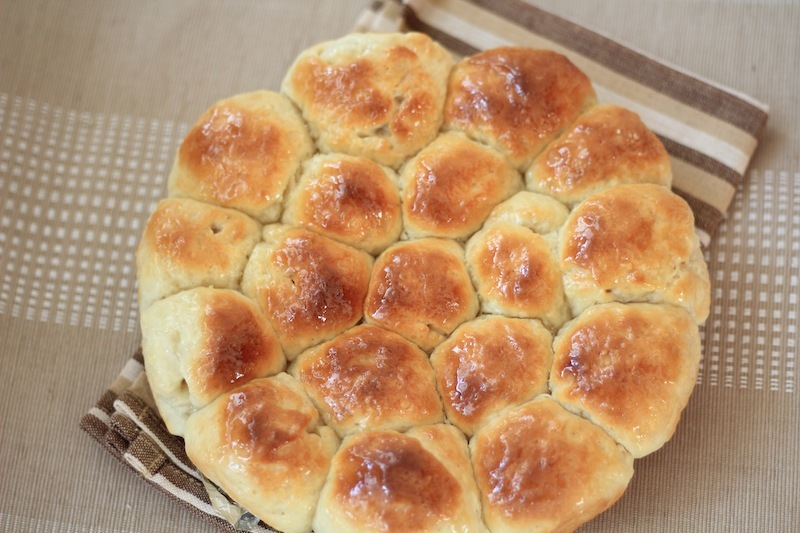 This bread can be made sweet or savoury. I chose to make it sweet with tutti frutti filling and topped with a sugar syrup glaze. Put 2 cups of the flour, salt, sugar and melted butter in the bowl and mix well. If you are using a processor, run it a couple of times to mix well. Combine milk, sugar and yeast in a small bowl and keep it aside for 5 minutes. Add this to the flour mixture and knead it well till you have a smooth and elastic dough which is not sticky. You can add the additional ½ cup of flour as much as you require to get this desired dough consistency. I used about 2¼ cups of flour. Shape the dough into a ball and place it in a well-oiled bowl. Turn it to coat the dough completely with the oil. Cover the bowl with a kitchen towel and keep the dough aside till it doubles in volume. Place the dough on your work counter and split it into two parts. Take each part and roll it out into a long cylindrical shape which is roughly about 9 inches long. Cut the dough into 1 inch pieces. You will end up with a total of 18 pieces. Take each piece and flatten it out a little and place half a teaspoon of filling in the centre. Pull up the sides and wrap the dough around the filling and then pinch it close at the top. Smoothen it into a round ball. Repeat the process with the rest of the 17 pieces. Place the buns in a well-greased round 9 inch baking tray. Arrange the filled balls of dough in concentric circles. Cover the baking tray with a kitchen towel and let it rise for about 30 to 40 minutes. 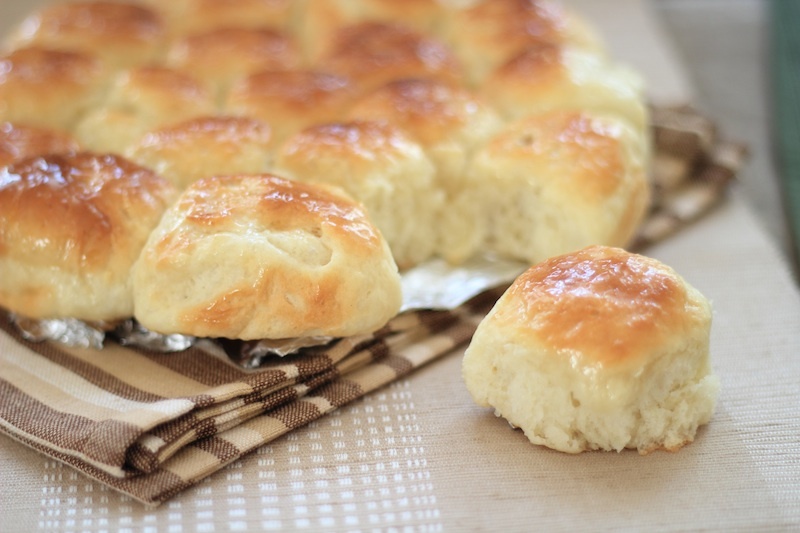 Brush the top of the buns with milk. If you are making savoury bread, sprinkle sesame seeds on top. Bake the buns at 180C (350F) for about 25 minutes, until they’re done and a has golden brown finish on top. Take it off the tin once it cools a bit (~ 5 mins) brush it with the sugar glaze. Add sugar, water and saffron in a small pan and bring it to a boil. Now reduce the heat and let it simmer for a few minutes till it starts thickening a bit. Now take it off the heat and add the honey and the lime/ lemon juice. When the sweet buns come out of the oven, pour the glaze all over the top. The bread should be hot and the glaze should be cool. Adjust the sweetness of the buns by brushing less or more syrup. Let it sit for a while so that the glaze sets a bit. Serve warm!! Savoury - cream cheese OR crumbled feta cheese OR crumbled paneer/ cottage cheese, flavoured according to your choice. You can also use any other savoury filling that you want. Sweet - cream cheese (traditional filling), or any other filing of your choice like chocolate, dried fruit like dates, raisins, chopped nuts, chopped fruit , sweetened coconut filling among others. Ohhh Looks good. I am going to try this with part whole wheat flour. Do you have a picture of the cross section, I just want to see how the filling looks like?